Logansport City Hall is located at 501 East Broadway, Logansport, IN 46947; phone: 574-753-2551. Photo: Willard B. Place House, ca. 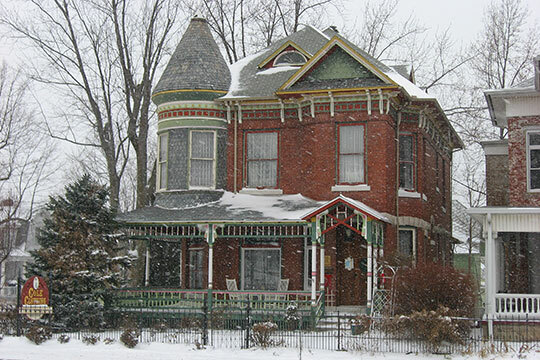 1889, 900 East Broadway, Logansport, IN. Listed on the National Register of Historic Places in 1998. Photographed by User:Nyttend (own work), 2012 [cc0-by-1.0 (creativecommons.org/publicdomain/zero/1.0/deed.en], via Wikimedia Commons, accessed July, 2015. Logansport was first settled in 1826, but for many years prior the Wabash Valley was a popular trading spot between the French and the Pottawatomie and Miami tribes. The town itself was named after a Shawnee scout, Captain Logan, who was a casualty of the War of 1812. Logansport was platted in 1828 and became part of the recently-formed Cass County. The original plat lay between the Eel and Wabash Rivers and extended east to what is now Fifth Street. The first economic boost came only two years after the city's settling when the Indian Agency, previously in Fort Wayne, was relocated to Logansport. The move was conducted by General John Tipton, an important early resident of Logansport, who was also responsible for routing Michigan Road through the city. The move attracted businesses and residents alike. Later that year the clearing of heavily-wooded city lots to make room for homes and businesses began. Logansport has had a long-standing tradition as a transportation center. From the time it was platted Logansport grew quickly with improvements in transportation. The Michigan Road, connecting Madison with Lake Michigan, via Indianapolis, came to Cass County in 1832. For decades this road was the most important north-south highway in Indiana. In 1838 the city incorporated, and it began to develop industries other than agriculture, enabled by the Wabash and Erie canal extending through Logansport in 1838. It provided access to almost 500 miles of canal extending as far away as Toledo, Ohio and Albany, New York, making it the longest in United States history. The canal ran along what is now Erie Avenue and turned north on Fifth Street. With the canal allowing for goods to be brought into Logansport on boats, industry and commerce were now a realistically viable option. The heyday for the canal coincided with the emergence of the first railroads to the county during the 1850's. Railroads and mismanagement of the canal led to its demise in 1875. The first railroad was introduced in 1852 and brought with it a new era of prosperity for the city. By 1870, Logansport's population boasted 12,000 residents. It was around this time that the bank building on Third Street and the various Italiante-styled commercial buildings were built downtown. The railroad lines that ran through Logansport, first the Newcastle and Richmond line and the subsequent Pennsylvania, Wabash, and Vandalia trains, created a variety of railroad oriented jobs and factories. The Wabash Depot, at the south end of Ninth Street, was erected and opened to the public in 1917 where it stood for the next 71 years. The building of all the railroads contributed to much of the development of both city and county. At one time Logansport was the second city in Indiana in transportation importance. This was due, not only to the railroads, but also to the network of electric lines centering here. These inter-urban lines came into general use about the middle 1890's and did a tremendous business until about 1915. The old inter-urban depot was first located in a Broadway storeroom and was later moved to Third Street, between E. Market and the Wabash River. As automobiles began to replace trains as the primary form of passenger transportation, Logansport continued its entrepreneurial tradition. Many cars were manufactured in Indiana during the early part of the century. Logansport produced two models, the Bendix and the Revere. While the Bendix only made a few vehicles, the Revere operated in Logansport from 1917-1926, making more than 2600 automobiles. Logansport still maintains a variety of automobile-related industries, although they have since become more specialized businesses. With the rise of the automobile came the decline of the railroads, and Logansport saw its final passenger railroad discontinue its service in 1970. With its agricultural and industrial heritage, Logansport has long attracted waves of immigrants and settlers, with each wave coinciding with growth of industry. Earlier waves of immigration included people of German, Irish, English, Italian, Dutch, and African American ancestry, each attracted to Logansport at different periods by the prospect of jobs and the qualities offered by the city. In more recent years immigrants and settlers have included those of Latino/Hispanic ancestry from various Central American countries, as well as Burmese and others. City of Logansport, Indiana, Logansport Comprehensive Plan, 2010, http://www.cityoflogansport.org, accessed July, 2015.